Eva Grayzel, a nationally recognized master storyteller and expert on interactive storytelling techniques with 25 years’ experience, enriches learning through the power of story. Eva created unique methods to involve every member of an audience or classroom in the story. 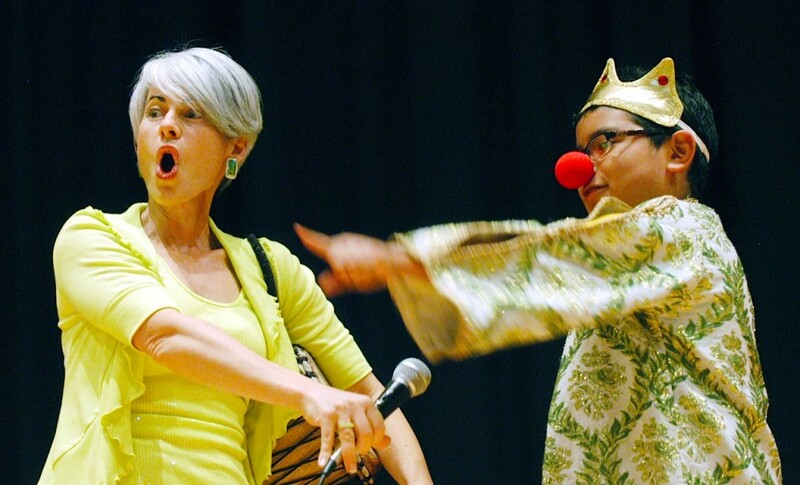 She performs and teaches nationwide. PBS interview of storyteller Eva Grayzel, an oral cancer survivor who continues to entertain and inspire audiences with her unique interactive storytelling techniques, imparting powerful messages at a performance at Farmersville Elementary School. Find your inner star! Eva spontaneously brings as many as 50 audience members on stage to role-play characters in stories from around the world. Every performance is theme-centered, emphasizing values and inspiring life messages. Belly laughs guaranteed! Achieve multi-sensory learning through interactive storytelling techniques. Discover how to introduce new subjects, social skills and life values while engaging imaginations and minds. How do we bring meaningful interactions into busy lifestyles? Learn strategies for teaching values while nourishing a foundation for building family communication. When The Going Gets Tough, Who Gets Going? Through her story about overcoming a life-threatening illness, Eva helps individuals find courage to stretch their ‘comfort zone’ and become a leader when someone is ill.
7-8AM: Bagel breakfast for teachers and workshop on interactive storytelling techniques.